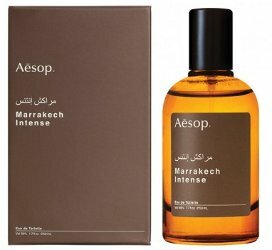 Australian botanical brand Aesop will launch Marrakech Intense, a new flanker to 2005's Marrakech fragrance. Marrakech Intense was developed by perfumer Barnabé Fillion. Notes include bergamot, cardamom, clove, neroli, jasmine, rose and cedar. Aesop Marrakech Intense will be available in 50 ml Eau de Toilette; look for it in September. Update: there will also be a 10 ml travel size. It looks like they just transliterated “intense” from the English alphabet to Arabic alphabet, rather than actually translating it into Arabic. I wonder if they couldn’t be bothered, or if Marrakesh Shadeed would sound weird or inappropriate to an Arabic speaker.